Nathan Myhrvold, a mad scientist/former Microsoft executive, has something of an interest in scientific approaches to cooking. His five-volume cookbook (plus a waterproof “Kitchen Manual”), Modernist Cuisine , describes the results of endless laboratory tests on how to really cook everything. I’ve flipped through this gargantuan tribute to one man’s obsession while visiting the Cookbook Store and am convinced it is worth the roughly $500 cover price. In whose shadow sits the Cookbook Store? 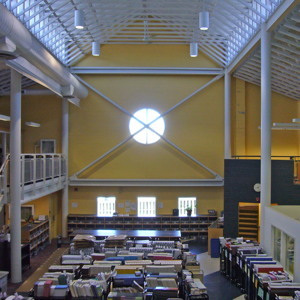 The Toronto Reference Library’s. Why shouldn’t the library own one or more copies of Modernist Cuisine ? But for that to happen they’d need something like a 2-for-1 or 3-for-1 deal. After getting no response from Myhrvold, I foolishly contacted his publicist, Judy Wilson, who showed she couldn’t even read a plain-text E-mail when she responded with “we aren’t offering review/desk or discounted copies to institutional faculty or libraries. We hope, however, that you will consider purchasing a copy online…. It sounds like it would be an excellent investment for your library.” My library? Not only is Myhrvold a patent troll, then, he’s cheap. I suppose that begins to explain how he became a billionaire. In part because the library is trying to shame me into terminating my use of blue suggestion forms, I am now documenting the titles I suggest TPL buy. Most of them they do in fact buy, but not without a hazing process nobody else has to suffer through. I’ll win in the end, of course. 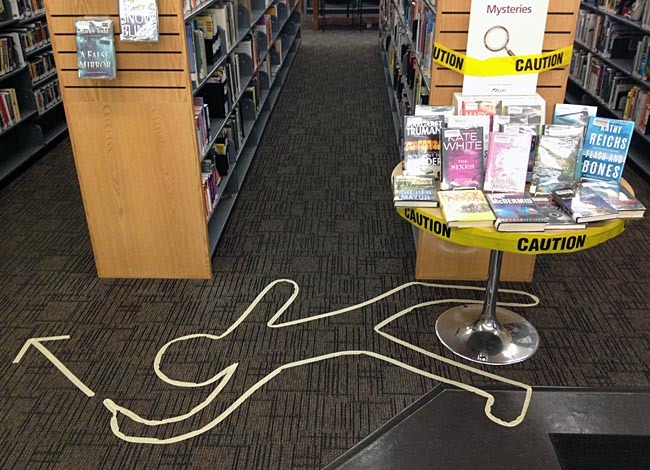 My kind of library display, Mysteries section, Gerrard/Ashdale. Here, then, are glories to come at the new Brentwood branch. Directly across from the registration desk is the express self-check-out area, designed for ultimate flexibility and to keep you from having to wait in line for the simple transactions surrounding book check-outs. While located so that staff can help if necessary, it is the ultimate in customer convenience. It is so easy, in fact, that you can teach your children to be independent library users! Mind that alarm sounding on the way in, kiddo. Do you need the booster? One bids adieu to @femwriter, who, like Spokesgay & Spokesgaysian, were baffled & stymied by TPLFans. Now a new one to break in, I guess. Anne Marie Akins leaves TPL to work as a flak for Metrolinx. Wait till she finds out I’m also a transit fan.